Did You Know Gravy Is a Key Ingredient to Smothering Cooking? So you're interested in learning How to Make Gravy? If you don't already know, making good gravy can be somewhat challenging at times. Making gravy is a good skill to know, because everyone loves gravy with their Holiday meals and Sunday dinner. When it comes to making gravy, you must practice, practice, practice. If you make some gravy often it becomes routine and the results will be spectacular. Before you go out and practice for perfection, here is the quick and easy, as far as what you need to know about how to make gravy. The best gravies are made from the drippings of cooked meat. To the meat drippings you must add additional fluids. Most people add broth, milk, meat juices or water. Flour is then added to the liquid mixture for thickening purposes. Last but not least, you add some form of seasoning to round out the gravy. A nice combination of herbs and spices for the particular meat you are cooking works well. Okay that was the how to make gravy cheat sheet. No it's time for an in-depth exploration of making gravy. Let me explain just how simple the process of making gravy can be. If you have tried this procedure before you'll probably say it doesn't work or it didn't work for me. Remember the key to making great gravy is practice, practice, practice. I will definitely admit that I didn't get this right the first time either. However after several attempts, I was able to make some decent gravy. Even better after about two months of practice, everyone said I made the best gravy. These ingredients work fine, if you're just looking to make a little gravy to pour over your rice or meat. Start with about two tablespoons of meat drippings. This makes about 10 ounces of gravy. If you're looking to smother your meats you'll need a lot more. Just stick with the basics first and you can graduate to a more advances gravy making technique like smothered cooking in the future. You will start your gravy off with the meat drippings from cooked or browned meat. The drippings should be heated over medium-low heat. To the drippings you will sprinkle your flour. Mix the four with the drippings by gently stirring (with whisk) the two together for about 1 minute. Next you will gradually add either broth, milk, meat juices, water or a combination. I prefer the meat juices if they are available, followed by broth. Depending on the type of meat you're cooking, milk works fine or you can go with water. Just experiment and keep a record of what taste best to you. Continue to stir (with whisk) the gravy while you gradually add the liquid. Soon the gravy will begin to thicken and boil, at which time you add your seasoning mixture to taste -- then the gravy is ready to serve. That was your detailed instructions on how to make gravy. Here are some solutions to fixing your gravy, if something goes wrong. 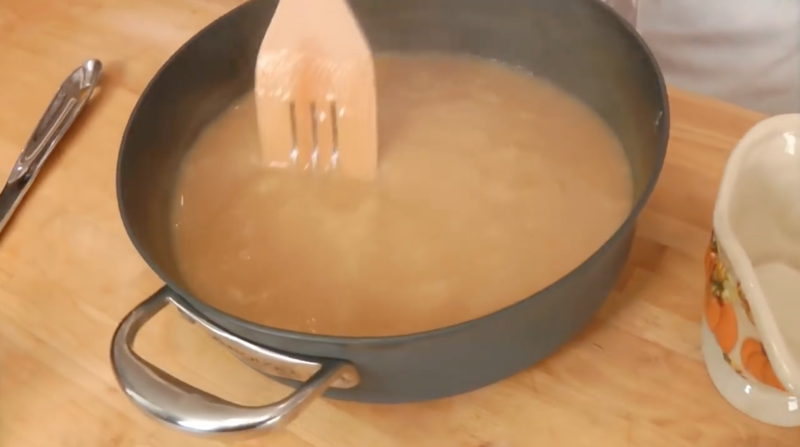 If the gravy is too thick slowly whisk in more liquid until you reached the desired thickness. If the gravy is not thick enough in a separate container blend equal amounts of flour and cold water together and slowly add to gravy until desired thickness. If the gravy is too lumpy whisk gravy until it is smooth. Do you remember the key to how to make gravy? Practice, practice, and more practice. With plenty of proactive you soon will make delicious gravy to.